Hi Crafty Friends! I’m so excited to share today’s card with you. I made it for Tacky Tuesday’s Challenge. 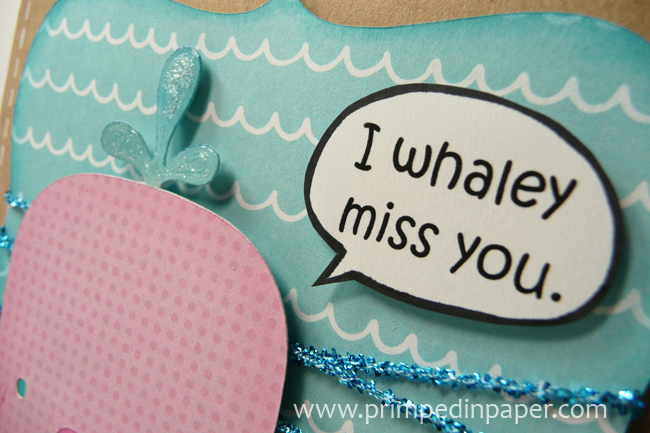 The challenge is to use the Whale from the Create A Critter cartridge and make a play on words for the sentiment. I love puns, especially ones that are animal related. So I had a lot of fun making this card. If you would like to join the challenge go to FaceBook and search “Tacky Tuesday’s Challenge” and join the group. She's still adorable even when she's sad. Patterned paper from Me & My Big Ideas. Her little tear and spout are covered with Crystal Effects. I typed the sentiment on my computer using Kristen ITC at 16 point. 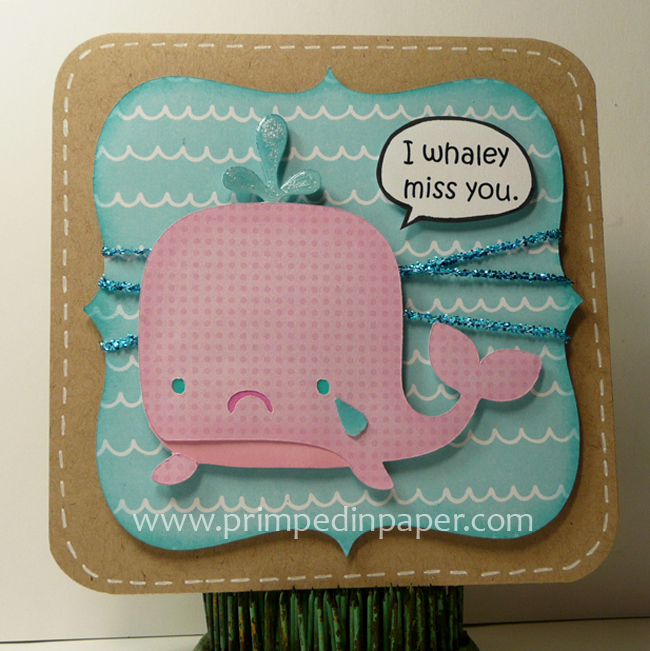 I used my Gypsy to get the frown on my whale. To see a complete tutorial on how to do this click here to watch my YouTube video. 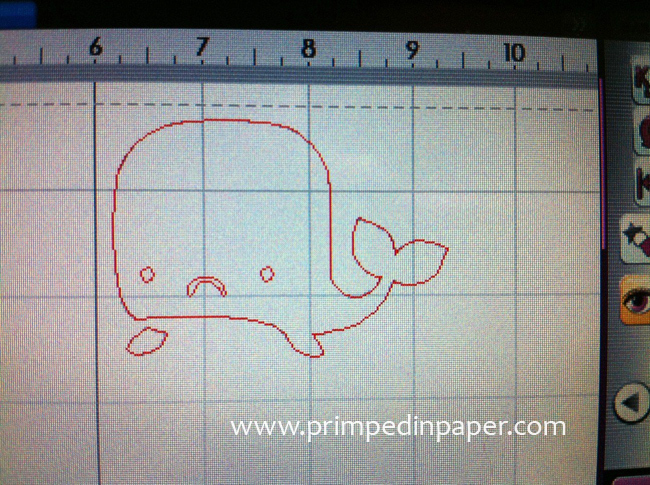 Gypsy image of creating the whale frown. 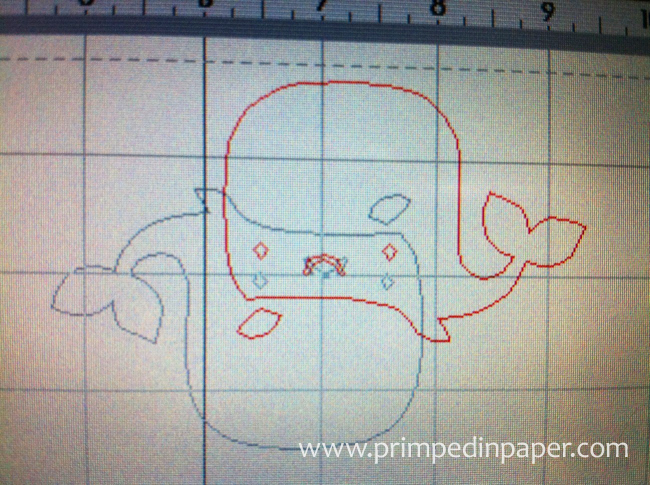 In the image above I have grouped together two top layers for the whale. For image #1 in red, I hid the mouth. For image #2 in grey, I hid the body, flipper and both eyes. Next I rotated the image so it was upside down and then aligned it’s mouth where image #1’s mouth was. Then I welded them together. When you press the eyeball key to preview your cut, you will see the image below. Gypsy preview of final cut. 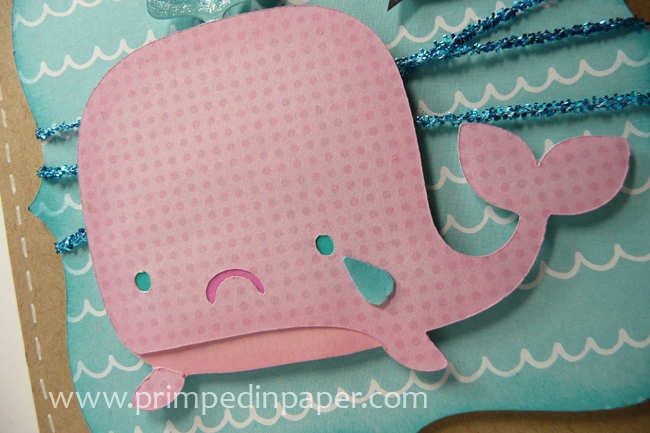 One sad little whale. If you have any questions or would like to see the video tutorial please click here. Thank you so much for stopping by today! I hope you have a fabulous weekend! Today I have a Valentine Card for you. 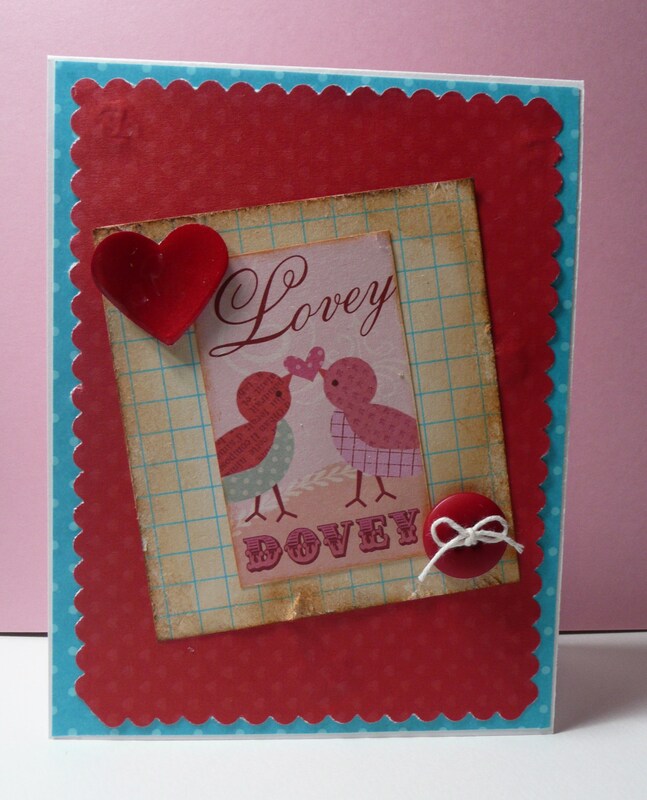 If you would like to learn to make this card follow the link below for a video tutorial. 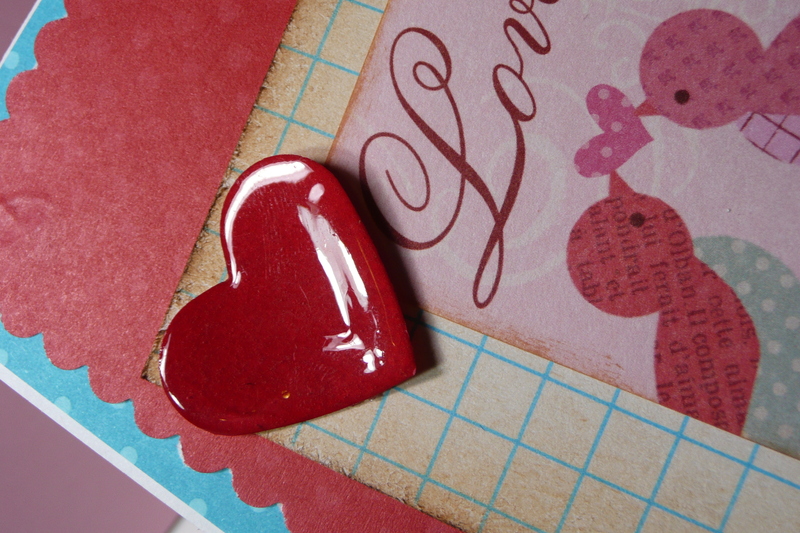 Here’s the products used to make this cute Valentine’s card. Blue polka dot background paper – Target Dollar Bin, Calendar collection. Red patterned paper – Target Dollar Bin, 5×7 Valentine collection. Edged with Creative Memories scallop scissor. Grid Index card- Distressed with Tea Dye Distress ink and nail file. 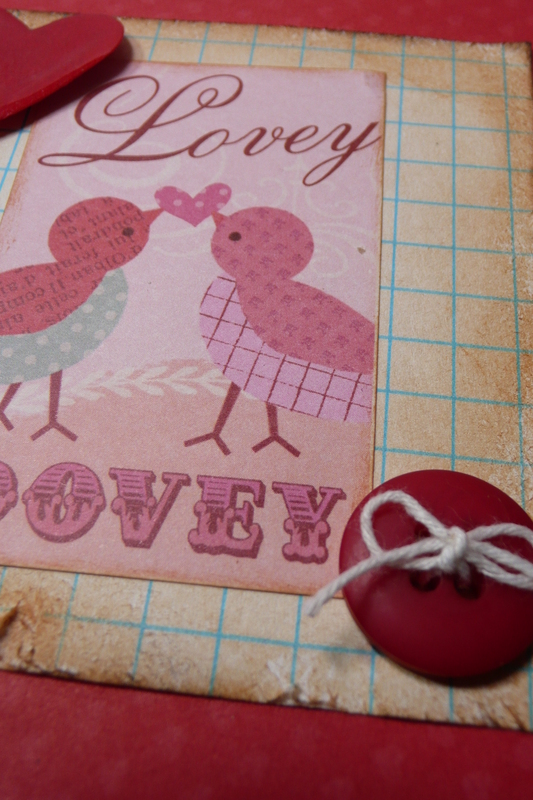 Lovey Dovey Birds – K & Company Sweet Talk Postage Stamps patterned paper. Edges distressed with Tea Dye ink. Heart – Martha Stewart 1 inch punch, Embossed with UTEE 4 times. Button – From my stash. I tied white string in a bow to add more interest. The Foam that I used with my Distress Ink was inside a box of earrings that I got from Avon. Lovey Dovey Birds, K & Company Sweet Talk Postage Stamps patterned paper. 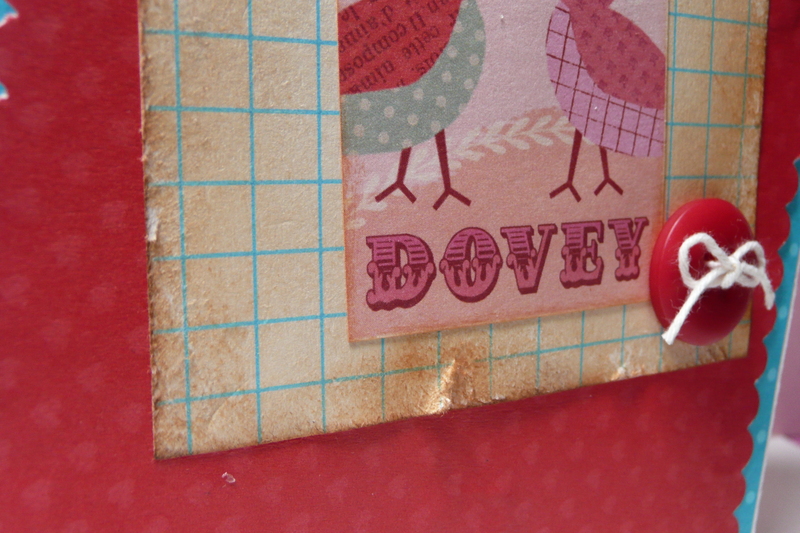 Grid index card is distressed with Tim Holtz distress ink in Tea Dye and I used a nail file on the edges.